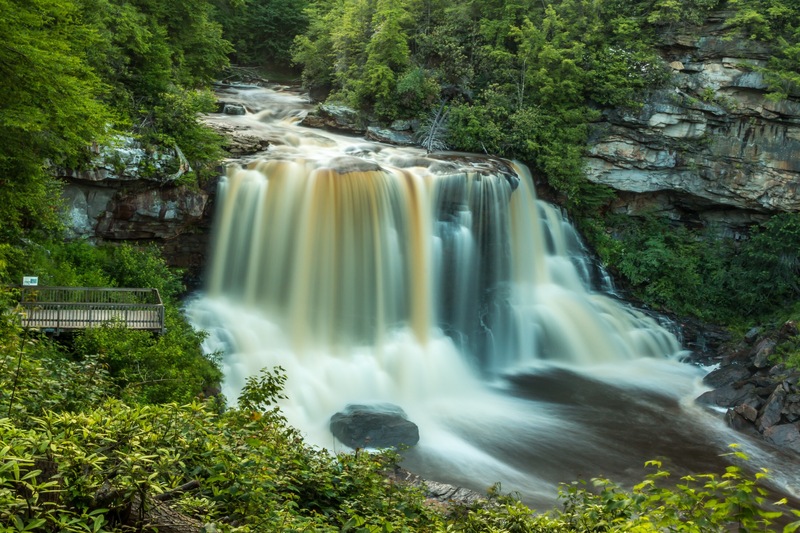 I’ve wanted to visit Blackwater Falls….for years now. The problem is that it has always been “just out of reach”. 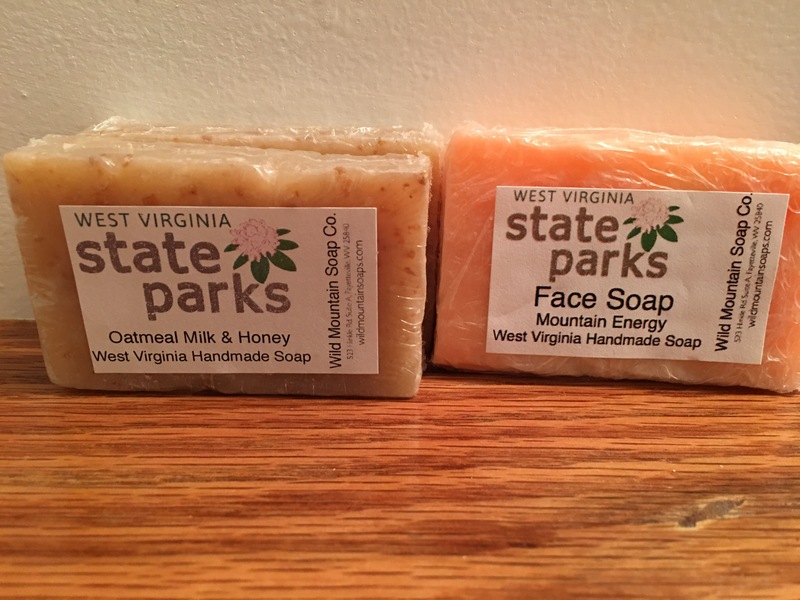 I reside in central NC, and I make trips into central and southern West Virginia several times a year. Northern West Virginia doubles the 2 1/2 hour ride I normally set aside for West Virginia explorations. 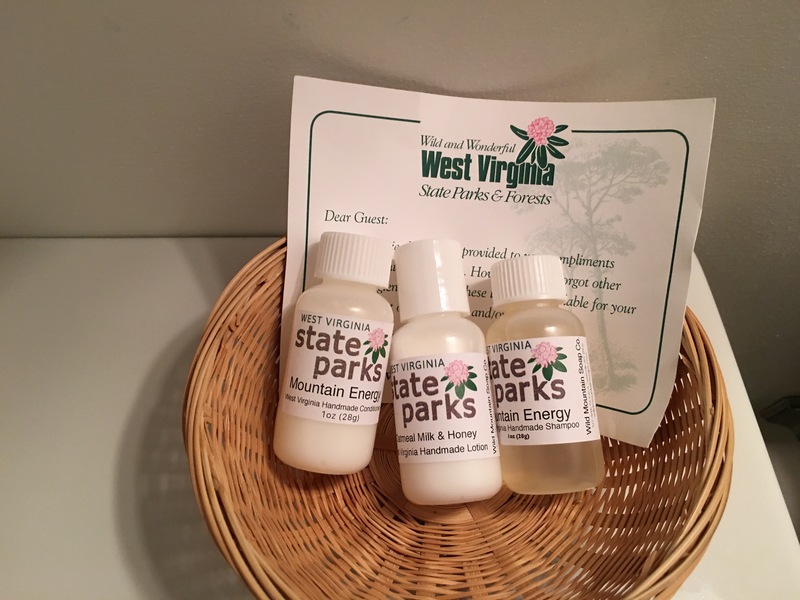 The main reason I was headed to West Virginia in the first place was to find water. Western NC, SC and eastern TN have been suffering abnormally dry starts to the summer of 2016, but not the Virginias. 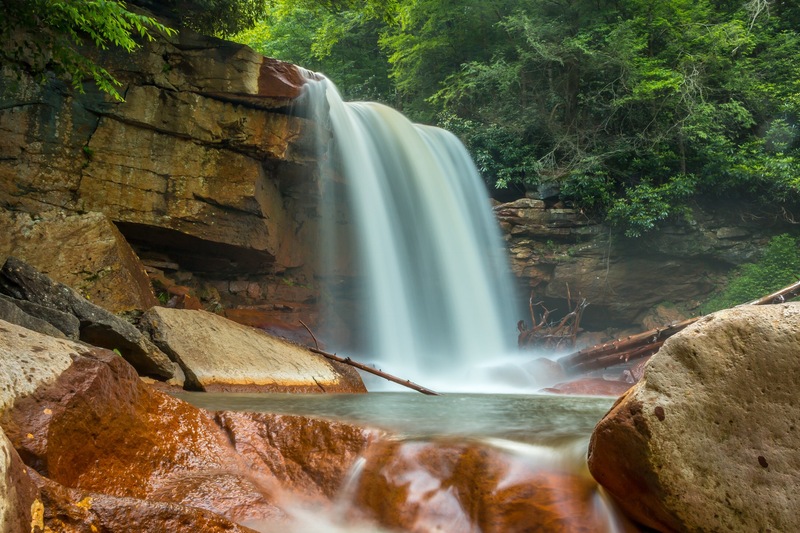 Facebook photos of favorite NC waterfalls were displaying pitifully low waterflows, rendering rivers into trickling creeks. On the Saturday of my departure, WV had just suffered 8-10 inches of rain in places two days prior, and there were reports of flooding in areas. This was where I would find water. 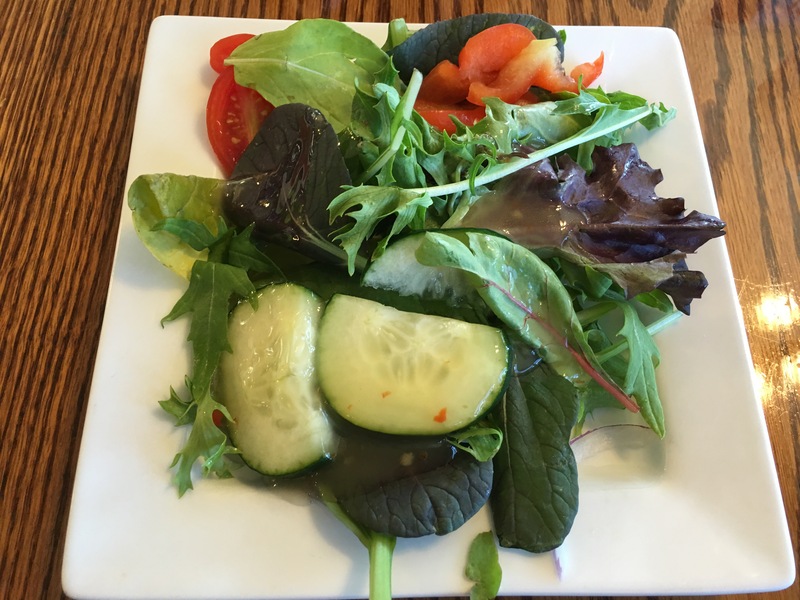 Sometimes, as most know, too much of a good thing…..is not a good thing. As I made my way north, the airwaves changed from music to emergency talk shows. Not only had there been some flooding, but extreme flooding in central and and southern West Virginia, especially along the US 60 corridor and WV 20 area. The 8-10 inches combined with West Virginia’s mountainous landscape created flash floods of historic proportions. Roads were washed away leaving people stranded. Whole towns inundated with water, homes flooded…some captured on video floating down swollen rivers. Very sadly, the death toll from this natural disaster was at 23. My heart goes out to all those folks and families affected. It will take a long time for these communities to rebound. I gathered enough info driving north on I-77 to re-route my course and find a new destination, or turn around for home. The emergency rescue and recovery operations were in full force, and I did not need to be in there. I am not the type to waste 2 1/2 hours, so I began to search for new destinations. The only idea that seemed logical was to keep going north. Out of the disaster areas but still in an area that had recently received significant rainfall, was my thinking. 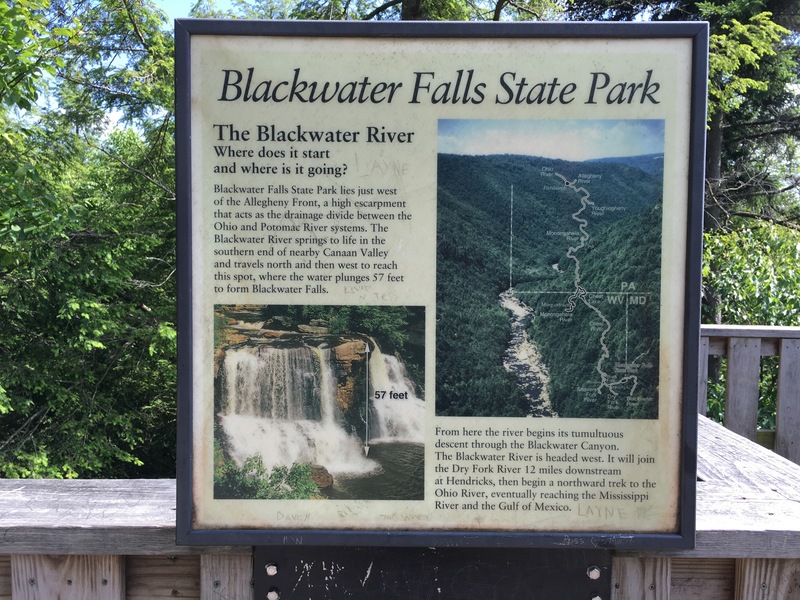 At first I just kept driving north along US 19, slowly, the idea of Blackwater Falls took over. It was finally time to see this beauty. I kept driving, and driving. Except for 1 small area along US 19 where I could see some minor flooding, I saw no signs of the disaster that I was now listening to every detail….with great attention. It was actually a very pretty day in WV, and the landscapes I drove through were gorgeous, especially once off of I-79. It was also mainly a 4 lane highway for like 95% of the way making travel very pleasant. As I made my way into the Canaan Valley, I got my first view of the Blackwater River. It didn’t look like much, just a large creek/small river just meandering through the valley. I could definitely tell that I was out of the flood regions by the water levels. 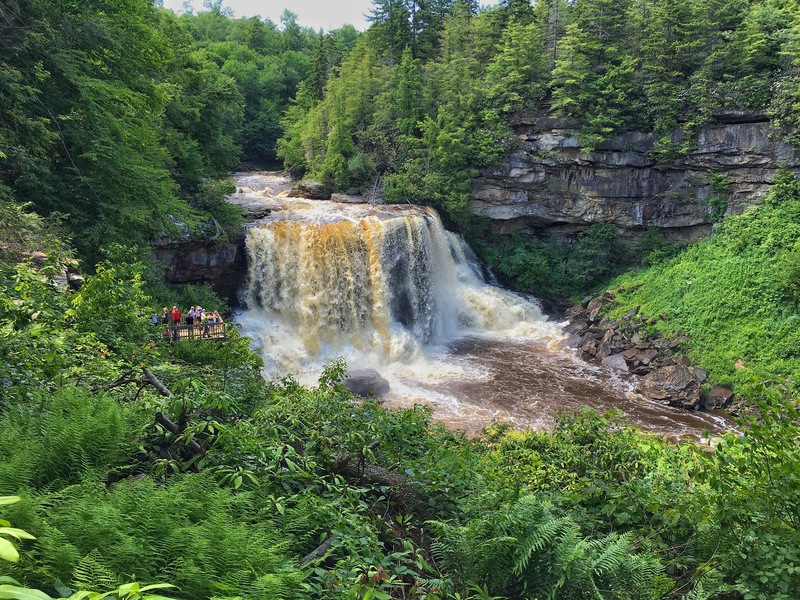 So, Blackwater Falls State Park was destination number 1. I would then need to find a room as it was now 3:30 in the afternoon, and this day trip was going to be stretched into a weekend trip. 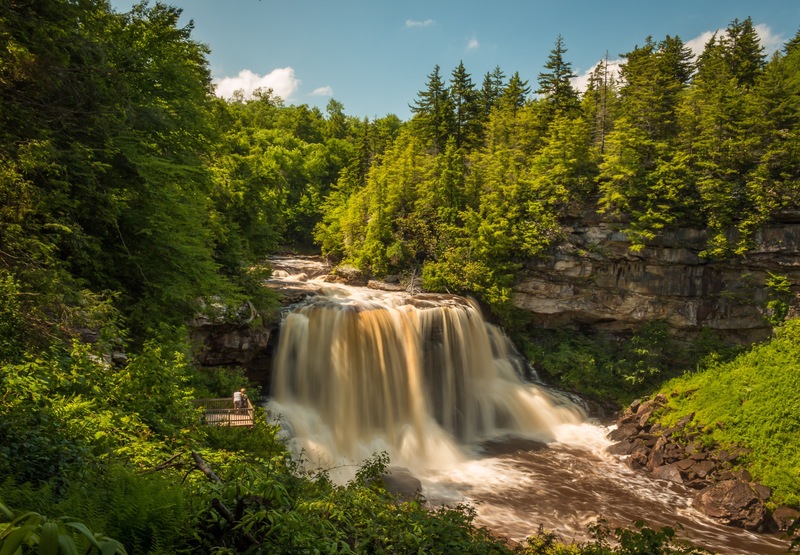 Once inside of Blackwater Falls State Park, it was just beautiful. 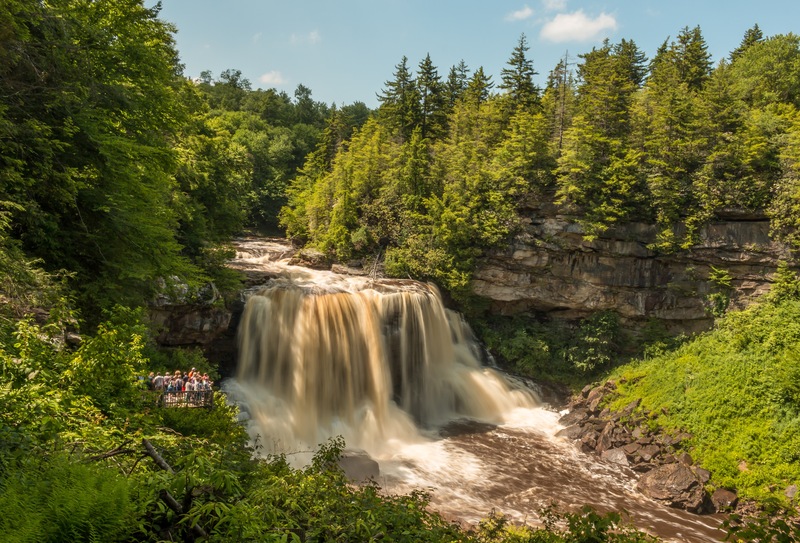 It was a short, several minute drive to the parking lot for Blackwater Falls. This is a popular place and there were a lot of people here. 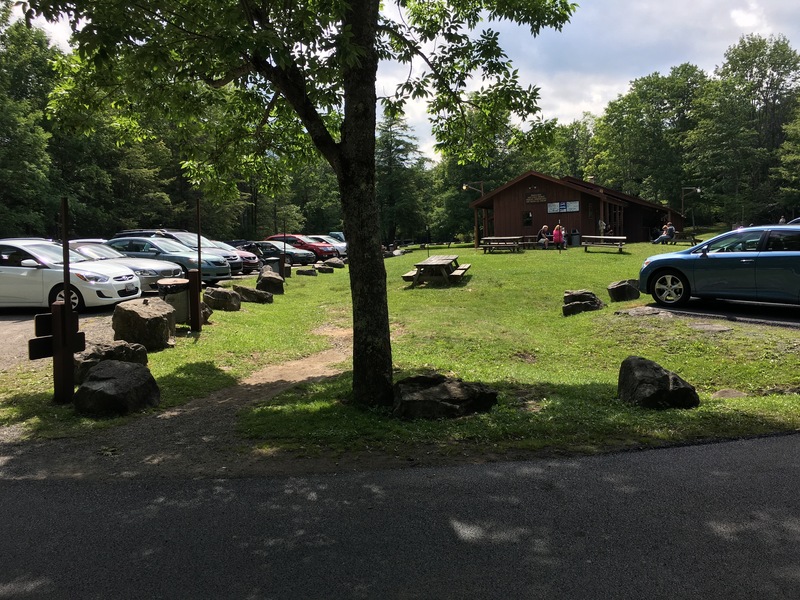 The parking lot was full, and the walk to the viewing area for the falls is very short. 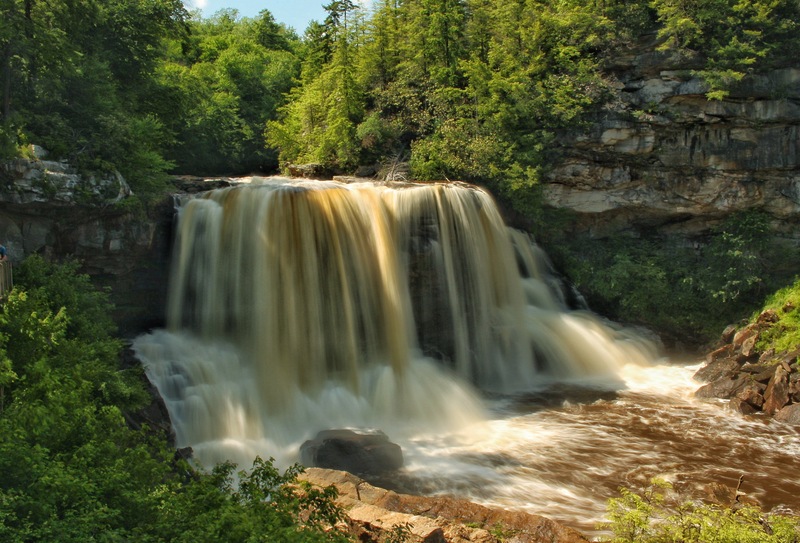 From the trailhead, the thundering power of Blackwater Falls can be heard and felt. Was this the same, small meandering stream I crossed while driving through the Canaan Valley? Yes! Wow! First sight was just amazing. The water was still high. I could not determine this from the Canaan Valley crossing, but I definitely could here. 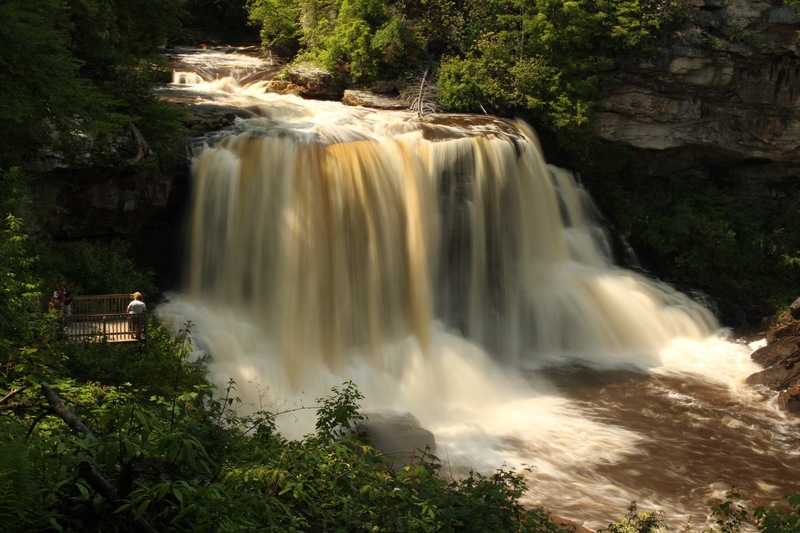 Gone was the big rock formation in the middle that gives the falls its signature “split”. One of the photos above shows the viewing deck next to the falls filled with people. Use this to truly see how big and powerful this waterfall really is. It was an amazing waterfall, especially for a 57 footer. The lighting conditions and the number of people did not make this a prime photo opportunity. I was going to have to stay close by and visit again when the conditions improved. When I visit places like this, I like to visit the “visitor area”, explore more, maybe buy some gifts for loved ones…etc. 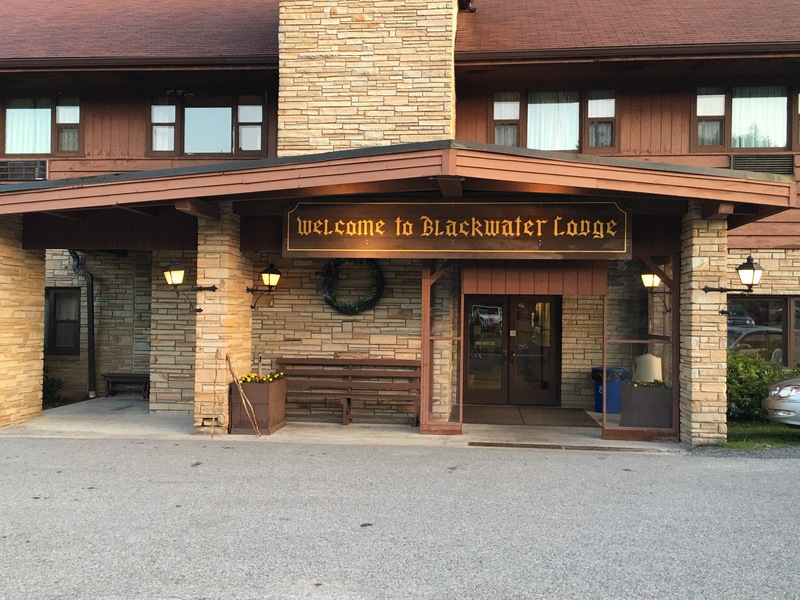 This particular park, I had to find the Blackwater Falls lodge. It was easy to follow the signs back a short ways then a right turn which leads right to it. I am not sure what I was expecting, but I found waterfall paradise! This was a full lodge/hotel. They even had a room available at 4:30 pm for that night, a Saturday… I took it quickly. The rates were very reasonable, especially for what would seem to be one of the peak visitor times of the year. The gift shop was awesome here. Every item I did not bring for an overnight trip was here, along with some cool souvenirs and lots of T-shirts. 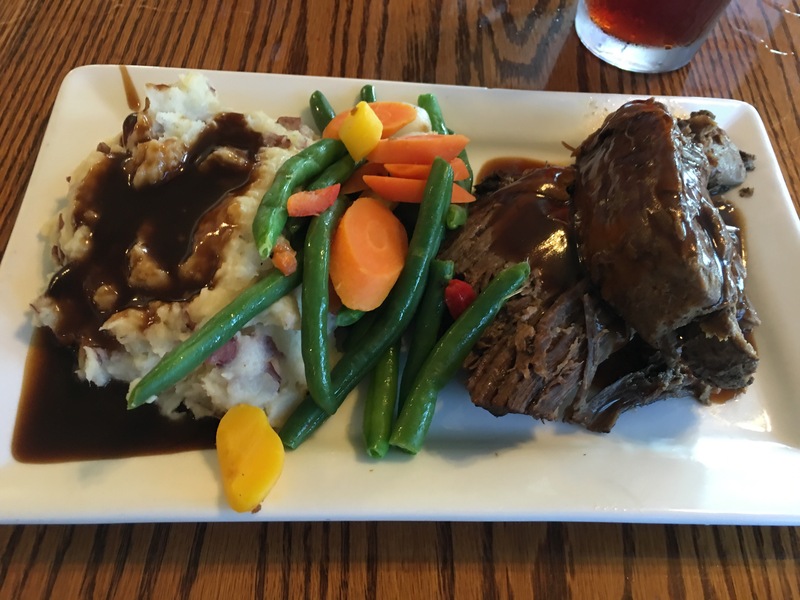 There was a very nice restaurant located here called the Smokehouse, and dinner here was wonderful. One can even dine outside with a nice view of the Blackwater gorge. High in elevation it was a nice 78 degrees or so and felt so, so much better than the mid 90s and high humidity I left behind in NC. It is also a large conference center. 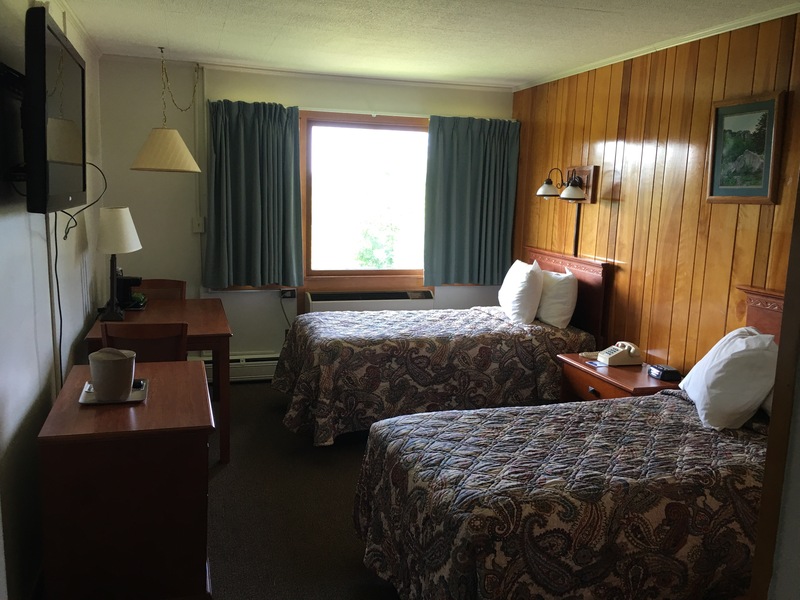 The rooms are a tad dated, but still comfy. Wifi is available but it’s slow. 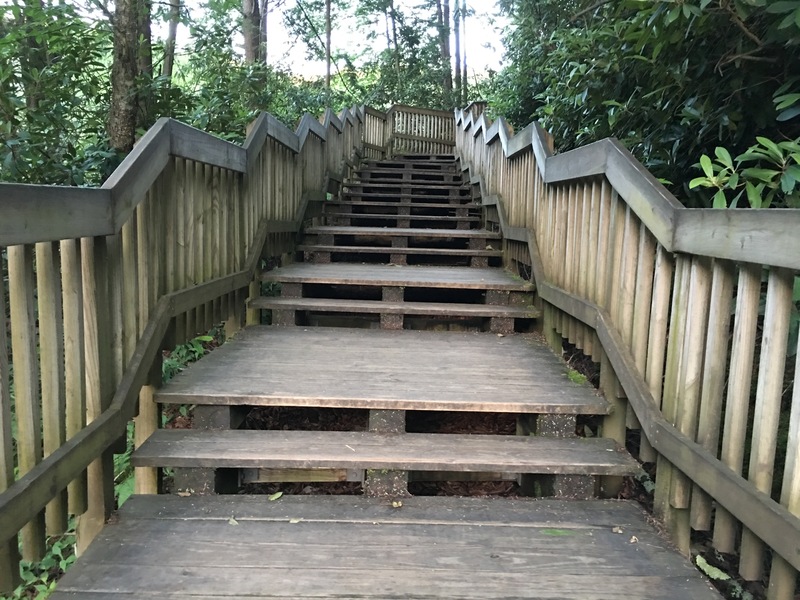 Once settled in my room, I learned that the Elakala Falls trail starts from the parking lot. 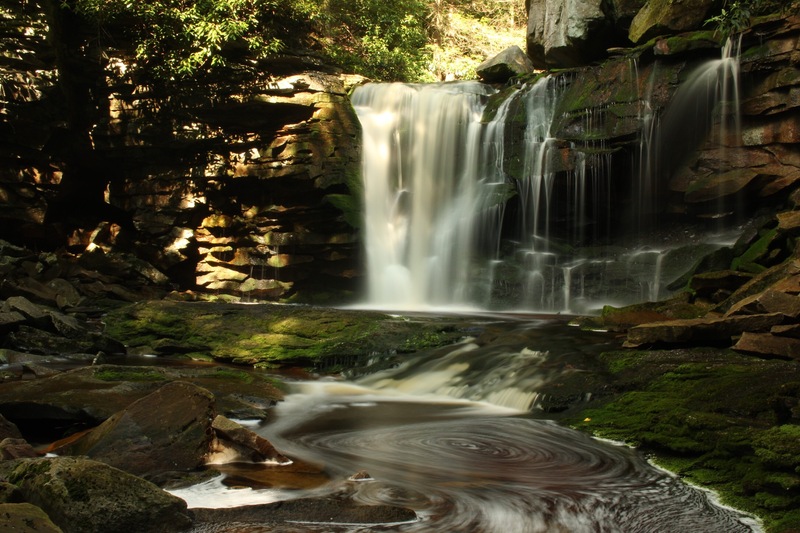 The famous West Virginia “Swirl” waterfall was just a moments walk away. How much better could it get? I visited the waterfall #1 just before dinner. Lighting conditions were still a bit rough at 6 pm here as well, I now had 2 waterfalls to visit after dinner, just before dark. More on Elakala Falls can be found by clicking my blog for Elakala Falls on Shays Run. Just a few images of the Lodge, dinner, and room while waiting for the sun to work its way down, I was very excited to have the opportunity to photograph these 2 epic West Virginia waterfalls and have the amenities that this awesome State Park offers to allow me to do so. As 8 pm approached, I got my gear and made the short walk back to Elakala Falls #1. 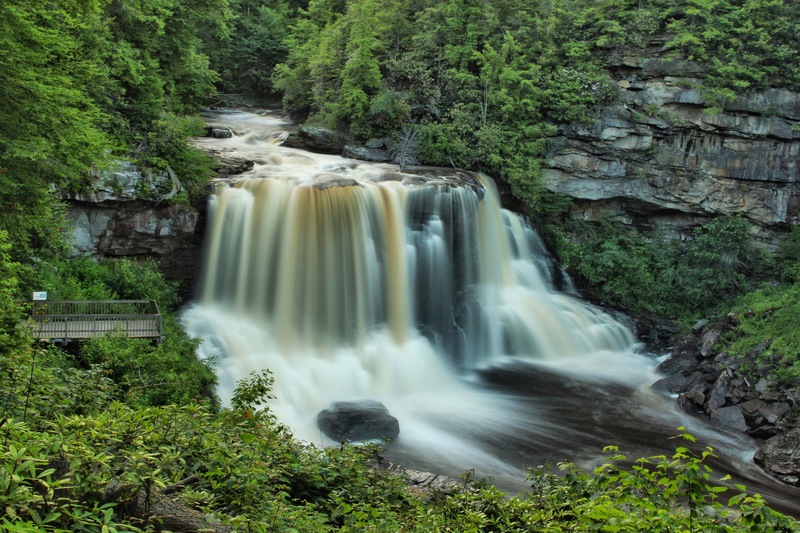 There are 3 more noted waterfalls downstream, but are said to be more and more difficult as the trail descends with Shays Run on its way to the Blackwater River. I don’t like leaving known falls unseen, but time was a valuable thing. I still had Douglas Falls to do first thing the next morning. Here is a view from the “improved lighting ” conditions at Elakala. Yes!! The decision to have dinner and come back was an excellent choice. I was very pleased with how they turned out. 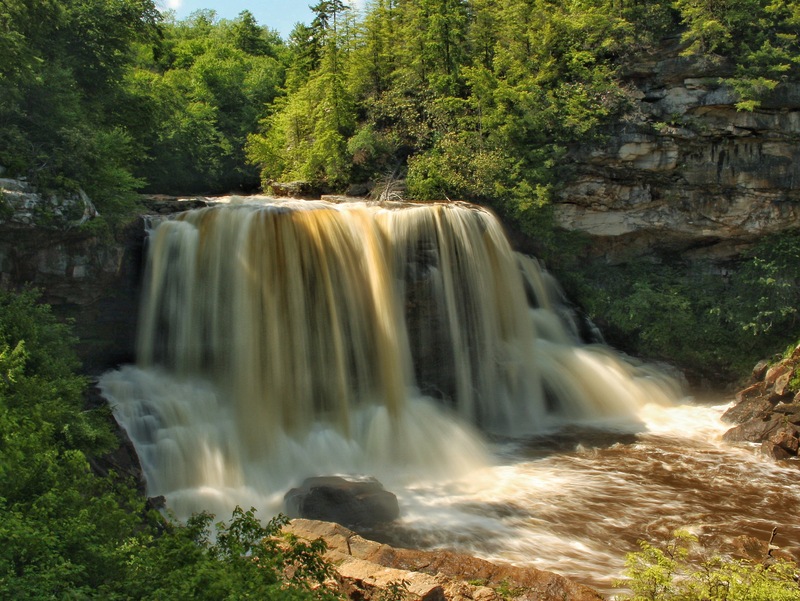 Now, back to Blackwater Falls. A short 3 minute car ride, led me back to the large parking area, now empty of visitors. 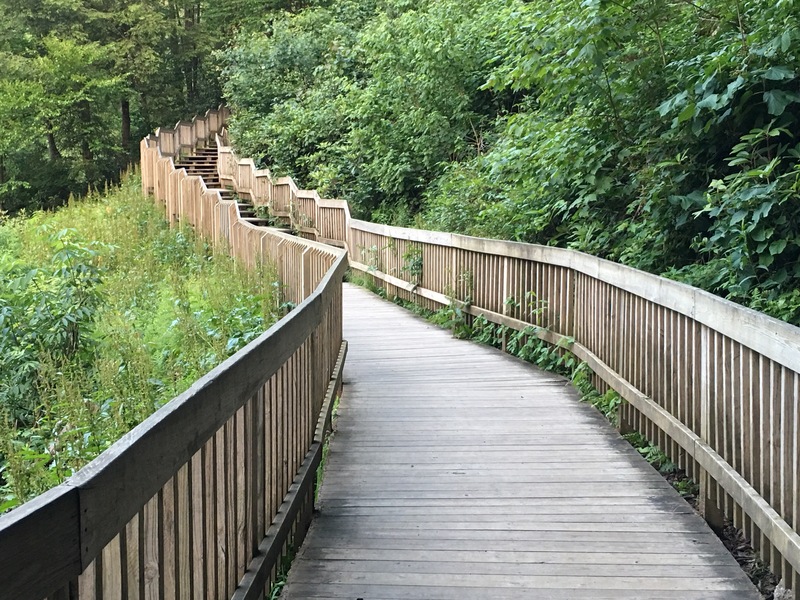 The short, beautiful wooden boardwalk to the falls was also now all mine. I will post a few slow shutter images of the bright afternoon and the cool evening sessions. Now a few from the evening trip. It was about 8:45 pm now. They didn’t turn out quite as well as I hoped. I think the Elakala shots turned out better. It was still an awesome sight, and having it all to myself was amazing. Well, almost all to myself. I did have to share it with this guy. After a nice night at the lodge, I made my way out very early the next morning for Douglas Falls. 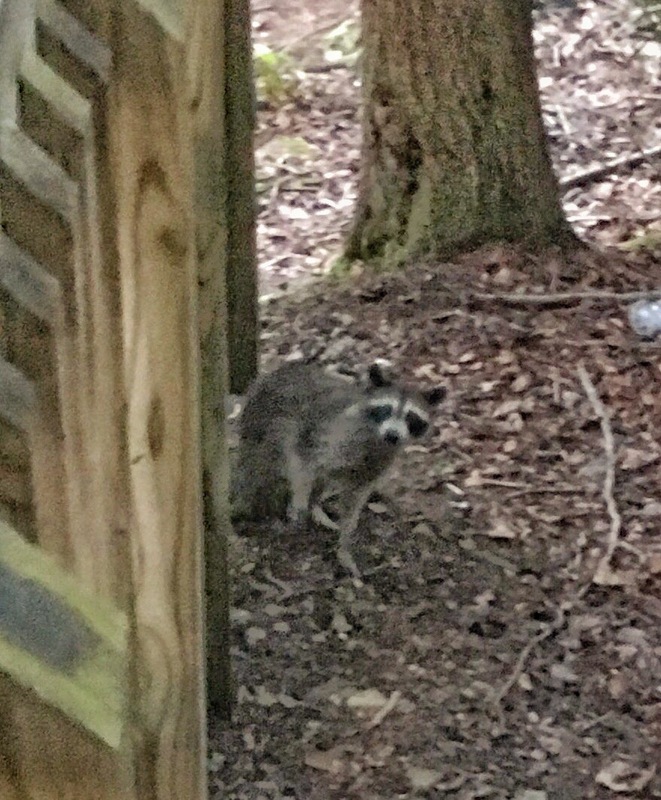 I knew it was nearby, but it was very close, like 10-15 minutes away. Click here for more on Douglas Falls. After Douglas, I had breakfast, packed up and began the long trip back to NC. 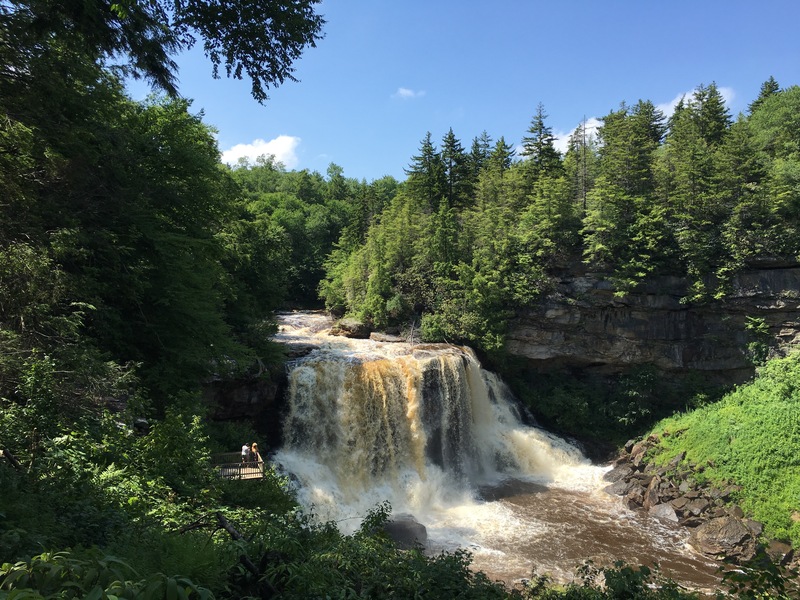 I thoroughly enjoyed my short stay here and am now planning a longer stay, one that I can further explore the amazing falls and history up here. I would certainly recommend this destination for anyone who likes to get out and explore. More info on the accommodations can be found by clicking here. 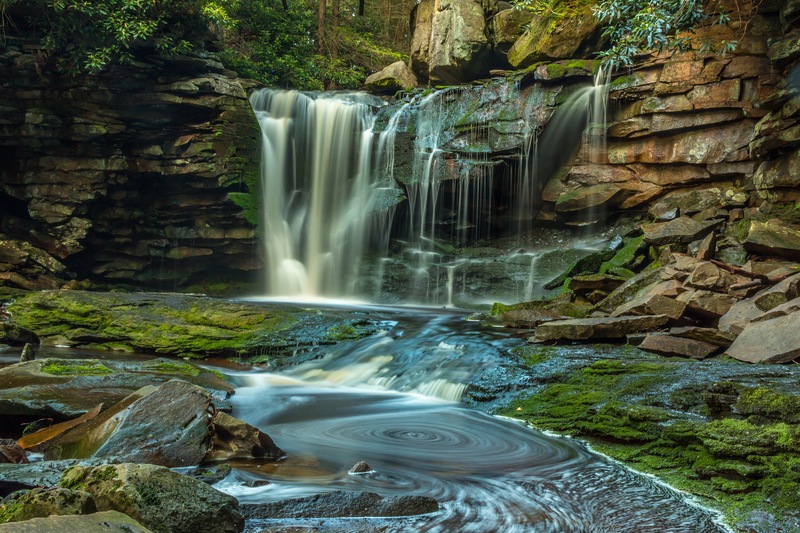 To purchase select prints of theses and other waterfalls, please click On my Fine Art Site here.